Warrior Breed boxer Amaar Akbar celebrates beating James McMeekin to reach the National Amateur Boxing Championships quarter-final. 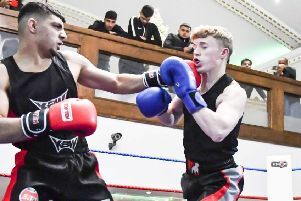 Amaar Akbar, of the Warrior Breed Gym in Dewsbury, has booked a place in the National Amateur Boxing Championships quarter-finals. Having secured the Yorkshire title with wins over Callum Dyce (Tommy Coyle Academy) and Owen Durnan (Sheffield Boxing Centre), Amaar met North East champion James McMeekin in County Durham. The NABC’s, which were formerly known as the CYP championships, often produce some of the most exiting amateur boxing in England. Wins over Dyce and Durnan saw Amaar claim the Yorkshire title, to the delight of the Warriors Breed team, whose spokesman said: “We saw Callum Dyce and Owen Durnan box each other in the Yorkshire Championships last season, we knew from past experience they were really tough opponents. Elected as the Yorkshire representative, Amaar’s third bout in as many saw him meet the experienced McMeekin and the Dewsbury man was again successful to set up a quarter-final with the North West’s representative. Speaking of his win, Amaar said: “This was my 20th bout in two years of boxing and I’m fortunate to have achieved so much. Amaar and Warrior Breed teammate Raheem Mustakeem had previously won gold medals at the Chairman’s Box Cup event and the gym also boast other champion boxers. Zahir Akbar, father of Amaar and head coach of Warrior Breed, said: “Khalid Ayub represented England in Croatia over the summer, unfortunately he didn’t get the decision we hoped for, but he is still young and the experience has changed him for the better. Warrior Breed’s Kabeer Khan and Dan Foster are boxing in Nottingham this weekend, while the gym offer classes for children, teenagers and adults and are based at 144 Bradford Road, Dewsbury, WF13 2HA.